Everyone in my family loves pizza. And, what better way to celebrate that love than with a homestead pizza party! This is no run-of-the-mill party though; this is a full-on feast of mature pies, best enjoyed when everyone pitches in to help with the creations. Here’s how to throw your own party. Invite a few friends over, open a bottle of your favorite wine (or beer), and spend the evening assembling, topping and baking each creative pie — just be sure to make a lot of dough the night before. Share the evening’s workload by asking each guest to bring their favorite pizza topping. Or, pull some interesting recipes and assign ingredients for each person to bring. This will be a night of eating in stages, as each new pizza comes out of the oven, cut it into small slices so everyone can taste something new, different; another person’s favorite. How about a raw kale salad with lemon, Romano and currents on a crispy pizza dough, or a six onion pizza; Soppressata, tomato, and olive oil; spinach, goat cheese and lemon zest; wild mushroom and Fontina cheese; roasted garlic, basil and grilled chicken, or improvise with your own unique topping combinations. Instead of making different kinds of pizza dough, make a large batch (enough for each pizza) of this crust the day before your pizza party. In a small bowl, whisk together yeast and 3/4 cup plus 2 tbsp. water heated to 85º. Let sit for 10 minutes. Put flour and sugar into bowl of a stand mixer fitted with a dough hook. Mix on low speed to combine. With mixer on, add yeast mixture, 1 tsp. oil, and 1 1/2 cups ice-cold water; knead until smooth and a dough forms around hook, about 7 minutes. Add salt and continue kneading for 2 minutes more. (If dough feels dry, add a few tbsp. cold water.) Divide dough into four portions, roll into tight balls, and transfer to a lightly floured baking sheet. Cover with plastic wrap and refrigerate overnight. 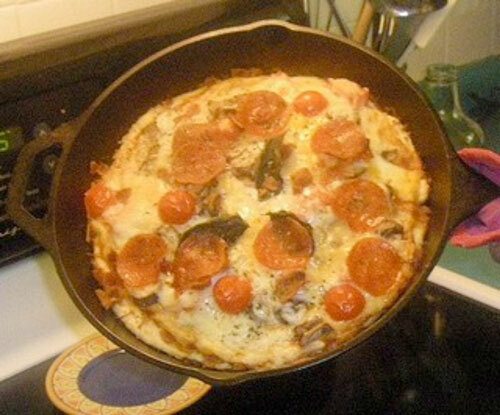 This recipe will make four 11” – 13” pizza pies. On the day of the Pizza Party: Remove dough from refrigerator and bring to room temperature. Put a pizza stone (cookie sheet or iron skillet) on the lowest oven rack and heat oven to 500 for at least 40 minutes. Take 1 ball of dough at a time, dust with flour and using your hands, stretch and shape dough into an 11″—13″ circle (or, press (carefully) into your skillet). Transfer dough to pizza stone or cookie sheet. Drizzle oil around the edge of the dough. Spoon about 1/2 cup or so of pizza sauce onto dough, leaving a 1″ border. Season with salt. Arrange toppings and cheese, drizzle pizza with more oil. Bake until golden brown and bubbly. Slide pizza onto a work surface, drizzle with more oil, if you like, and slice. Repeat the process with everyone’s topping combinations while enjoying a slice of warm pie. Add a simple Caesar salad and a variety of red and white wines for a truly wonderful evening of friendship and experimentation. Who knows, you may just come up with a new favorite!